The CNCI® is shaping the future of the Industry The Certified Network Cable Installer (CNCI®) program (which consists of the 5 day CNCI® Copper Cabling and the 5 day CNCI® Optical Fibre Cabling programs) and certification is helping to shape the future of the network cabling infrastructure industry by introducing professional and industry recognised certification to cable installers. The CNCI® is designed for those wishing to demonstrate the highest levels of knowledge, skills and expertise in network cabling infrastructures. With a team of professionally trained and CNCI® certified individuals the risks are significantly reduced and organisations can feel confident that their staff are competent to meet today’s industry demands. When you consider the huge risks associated with not employing professionally qualified staff, coupled with the impressive Return on Investment (ROI) from utilising trained staff, the answer is to have trained and qualified employees you can rely on to deliver consistent results. The CNCI® Copper Cabling program is comprehensive and blends a perfect mix of theoretical study and practical installation, testing and survey exercises providing the right level of knowledge and skills for copper installation practices and, combined with the CNCI® Optical Fibre Cabling program provides official CNCI® certification. This proves that an individual is qualified to undertake cable installation projects to the highest possible calibre whilst working to the current industry standards including BS EN, TIA and ISO, whilst following the very latest codes of best practice. During the program learners will also have access to current standards for reference purposes. The CNCI® Copper Cabling program consists of 195 pages of rich technical content of learning and reference material. This program is perfect for individuals wishing to acquire the very latest skills and knowledge to enable them to complete copper cable installation projects to the highest standards. It is relevant to new entrants to the cabling industry in addition to those already working within the cable installation environment wishing to formalise their skills. Project managers, IT personnel, installation technicians, network engineers and electricians would all benefit from attending this program. CNet Training now offer up to 12 months interest free payment options for those in the UK. Find out if you are eligible here. No previous experience is required to attend this program, however if you are working in the network infrastructure industry, it will prove advantageous. Successful learners will have the knowledge and skills to confidently install, test and certify a complete copper cable installation. This forms part of the entry level requirement into the Global Digital Infrastructure Education Framework which allows learners to progress their knowledge, education and skills in line with their career within these fast moving industries. 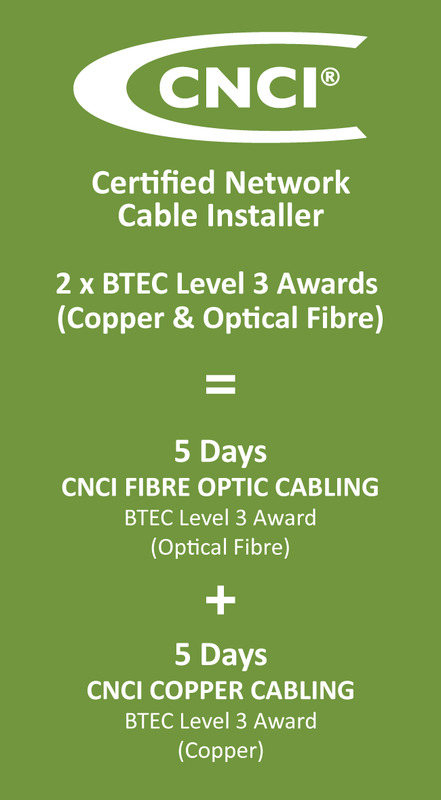 If you are entering the industry or looking to formalise your skills with an industry recognised qualification and gain units towards the official CNCI® certification, this program, combined with the CNCI® Optical Fibre Cabling program is perfect for you.